17/07/2014 - Global Value Chains (GVCs) are a dominant feature of the world economy that impact growth, jobs and development, but numerous challenges remain to ensure that all countries and all firms have the opportunity to participate and benefit, according to a new joint report from the Organisation for Economic Cooperation and Development (OECD), World Trade Organisation (WTO) and World Bank Group (WBG). Global Value Chains: Challenges, Opportunities and Implications for Policy, presented on the eve of the G20 Trade Ministers Meeting in Sydney, argues that success in international markets depends as much on the capacity to import high-quality inputs as the capacity to export: in an increasingly inter-connected global economy where more than 70% of trade is in intermediate goods and services, integration into GVCs today will determine future trade and FDI patterns as well as growth opportunities. The report outlines how the rise of GVCs has produced a new "trade-investment-services-know-how nexus" encompassing trade in intermediate inputs, the movement of capital and ideas and the growing demand for services to coordinate dispersed production locations. It highlights how interconnected economies are today, while pointing out the risk of policies which inhibit participation in GVCs, such as various forms of trade and investment restrictions. It also underscores the need for complementary policies, such as those that boost education and skills, to improve the ability of firms, and in particular those in less developed economies, to participate in and benefit from GVCs. 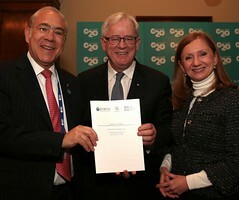 "Trade, investment and the development of GVCs are constrained by barriers in the manufacturing and agriculture sectors, a lack of progress in opening service markets, a range of behind-the-border restrictions and the still-unfinished work on trade facilitation," OECD Secretary-General Angel Gurría said during the launch of the report with Australian Trade and Investment Minister Andrew Robb. Read Mr. Gurría's speech. "Australia's G20 Presidency has set a challenging objective of boosting GDP growth by two percentage points above trend over five years. We must put trade at the centre of structural reforms in order to meet these ambitious yet attainable goals," Mr Gurría said. Implement and ratify the WTO Trade Facilitation Agreement, reached during the late-2013 ministerial meeting in Bali, Indonesia, as quickly as possible. OECD work on Trade Facilitation shows that simpler, speedier and more reliable border processes making it easier for goods and services to cross international borders will drastically reduce trading costs. Every 1% reduction in trade costs would generate benefits of 40 billion USD, with 65% of these gains accruing to developing countries. Improve services sector efficiencies, in recognition that services are essential elements in competitive manufacturing sectors, and thus vital links that forge GVCs. The new OECD Services Trade Restrictiveness Index allows the world's major services suppliers to benchmark their performance and to identify opportunities to improve it. Reinforce the standstill commitment against protectionism and wind back any restrictive measures implemented since the crisis, with a particular focus on non-tariff barriers. The OECD-WTO Trade in Value Added database clearly illustrates how much firms rely on access to world-class inputs to improve productivity growth and competitiveness. Continue structural reforms and well-designed complementary policies to accompany trade and investment opening. Participation in GVCs is not automatic: some less-developed countries and smaller firms worldwide are at risk of being left behind. Effective flanking policies will vary by country, by stage of development, by resource endowment and other factors. In all cases, however, countries should focus on investments in people, in education and skills, in active labour market policies that match labour supply and demand, and in adequate social safety nets for those facing difficulties adjusting. "Getting the policies right on GVCs is an essential step toward building a strong, balanced and sustainable framework for more inclusive growth, jobs and development,” Mr Gurría said. The new OECD-WTO-World Bank Group report is the latest in a series of reports requested by G20 leaders as part of wider efforts to analyse the functioning of GVCs and their relationship with trade and investment flows, development and jobs. The OECD hosted a G20 stocktaking seminar on GVCs in May 2014 in Paris. Media requests should be directed to the OECD Media Division (tel. +33 1 4524 9700).